We’re still around a month away from E3 – perhaps the biggest video game event of the year – but some potential announcements of video games like Borderlands 3 and Rage 2 may have been spoiled by an online retailer. 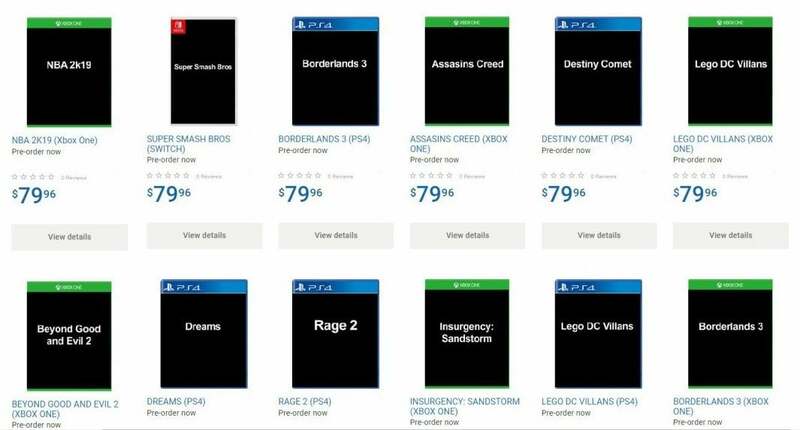 For better or for worse, it’s not a particularly unusual occurrence for an online retailer to jump the gun and post listings for games that aren’t out yet. The problem comes when they post listings for video games that haven’t even been announced, such as Borderlands 3 and Rage 2. This snafu was noticed by a Twitter user whose tweet we have included below. The listings still appear to be visible on Walmart’s Canadian website, but it’s likely they will get taken down rather swiftly in order to avoid problems from announcing video games before they are even officially revealed to the public. The fact that Borderlands 3 and Rage 2 were listed on the website seems to suggest that they are pretty far along in development – at least enough to be mentioned at E3, and the titles have fans eagerly awaiting a launch date that is hopefully sooner rather than later. Each title on the retail page is accompanied by a black, placeholder image instead of the actual box art which doesn’t give us many clues as to the actual content of the games, but recognizing that they will actually release is still pretty exciting news. You’ll notice that Borderlands 3 and Rage 2 aren’t the only video games that the company listed on the website, but they are perhaps the most notable as they weren’t even announced yet. Other games like “The Last of Us 2” and “Final Fantasy 7 Remake” also make an appearance, but we were already aware of their existence so it’s not that shocking to see them included in this posting. The Borderlands 3 release isn’t exactly surprising, as Borderlands 2 was incredibly successful. A sequel seems like a no-brainer, but when we were going to see it was still up in the air. While we still don’t have a release date and likely won’t until E3, it’s still a glimpse at some upcoming titles and enough to get fans excited across the web. The Splinter Cell title hadn’t had much fanfare previously, but it isn’t very shocking that it’s under development. With games like “Ghost Recon Wildlands” seeing massive success, it’s likely that the company will try to capitalize on that momentum with the release of a title in the same vein. As far as Destiny Comet goes, that’s likely the codename for an expansion pack for “Destiny 2” slated for later in 2018. Just like Splinter Cell, it is likely a placeholder for an eventual true name that will come to light as we get closer to an eventual release date. While Destiny 2 boasted an impressive player base upon release, it has since dwindled quite a bit. Like its predecessor, it’s likely that it will only pick up steam as it ages and finds its footing despite the developer’s best efforts to avoid their past mistakes. Hopefully Destiny Comet will usher it closer to that eventuality. Just Cause 4 will likely be another open-world action game in the same vein as Just Cause 3, and it’s not particularly shocking to see the release foreshadowed. However, what is especially strange is the announcement of Rage 2. The original game didn’t do so well, but considering that Bethesda has taken on tasks like revitalizing DOOM and Prey, it may be due for a reboot. As this is not an official announcement it should be taken with a grain of salt, but you shouldn’t be too surprised if at least a few of these titles receive an official announcement at the upcoming E3 trade show.